Balthasar van der Ast was taught by his brother-in-law Ambrosius Bosschaert the Elder (1573-1621), the pioneering flower painter of the first decades of the seventeenth century. 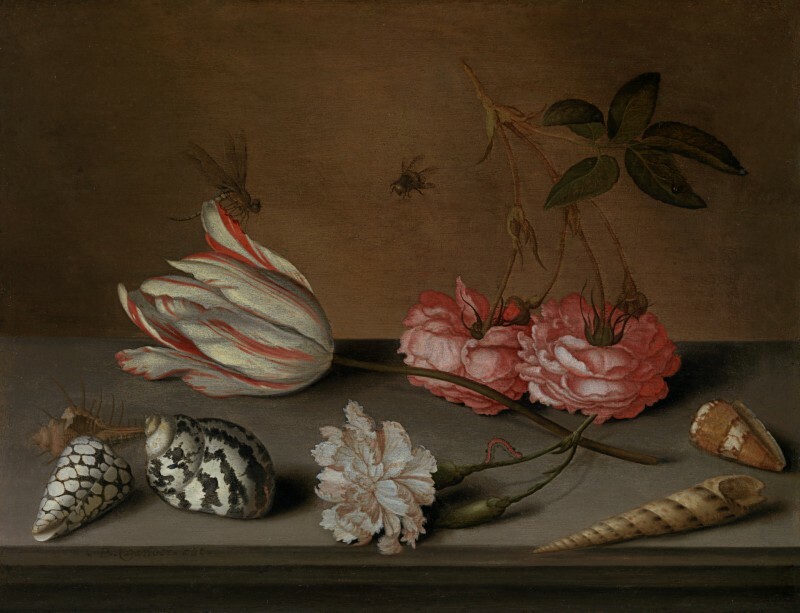 Van der Ast developed the tradition of his mentor, like Bosschaert producing paintings of flowers in vases on ledges, often with a few shells and insects scattered around. Works such as the present one from the 1630s, in which a choice number of blooms and a few shells are placed on a ledge with flying insects, are an innovation of van der Ast. The personality of each flower and shell is brought out by their being placed against neutral backgrounds, with just enough overlapping to bind the composition together. Van der Ast derives from Bosschaert the sense of sculptural solidity of his objects and exquisite attention to each individual petal or curl of shell, but gives his painting a softness and atmosphere that moves away from the more linear approach of Bosschaert and his own early work. He is not afraid to pose his flowers in unexpected ways, for example the roses placed face-down on the ledge, the better to appreciate the ruffles of the petals. The composition is dominated by the red-and-white striped tulip, a flower regarded as rare and precious in the 1630s. The northern Netherlands was in the grip of Tulipmania, with bulbs changing hands for thousands of florins by 1636-7. An Admirael van Enkhuizen bulb sold at an auction in Alkmaar on 5th February 1637 for 5,200 florins, when 10,000 florins would have purchased a fine house on a fashionable canal in Amsterdam. The market then dramatically collapsed, although the Dutch continued their skill in developing new tulips and the bloom kept its place in floral still lifes. The beautiful, flame-like markings so superbly delineated on van der Ast’s tulip were caused by a virus which ultimately weakened the bulb, although the cause was not known at the time. The fascination for connoisseurs was to see which bulbs would ‘break’ with these scarlet, burgundy or purple stripes. Commercial growers gave the varieties the grandiose names of Dutch military and naval heroes to make them more attractive. The tulip in the present painting is no doubt based on an example studied from life and recorded in watercolours kept in the studio for reference. A number of such watercolours, attributed to van der Ast, are in the Fondation Custodia, Paris. Balthasar van der Ast was born in Middelburg in 1593 or 1594, the son of a wealthy merchant in woollen clothing. He was trained from c.1610 in the studio of his twenty-year-older brother-in-law and guardian Ambrosius Bosschaert the Elder (1573-1621). He appears to have taken over the position of the leading painter of still lifes of flowers and fruit in the North Netherlands soon after Bosschaert’s death in 1621. During the 1620s and 1630s, van der Ast’s domicile Utrecht was the main Dutch centre of flower painting; besides van der Ast, among others, Roelant Savery, Johannes Baers, Jacob Marrel and Bosschaert’s sons worked there. In 1632 van der Ast himself moved to Delft where he joined the painters’ guild of St Luke and married the following year. He died there in 1657. For example La Novelle van dr Cuijp, inv. no.6534-25. Each tulip is named in elaborate calligraphy.